Vintage's Alyssa Andrews (2) forces Napa High's Sofia Brandon (21) to reassess her shot selection Tuesday night. Napa High's Siena Young tries to block a shot by Vintage's Kate Ilsley on Tuesday night. Vintage's Nicole Gleeson drives against Napa High's Maizy Armstrong-Brown on Tuesday night. 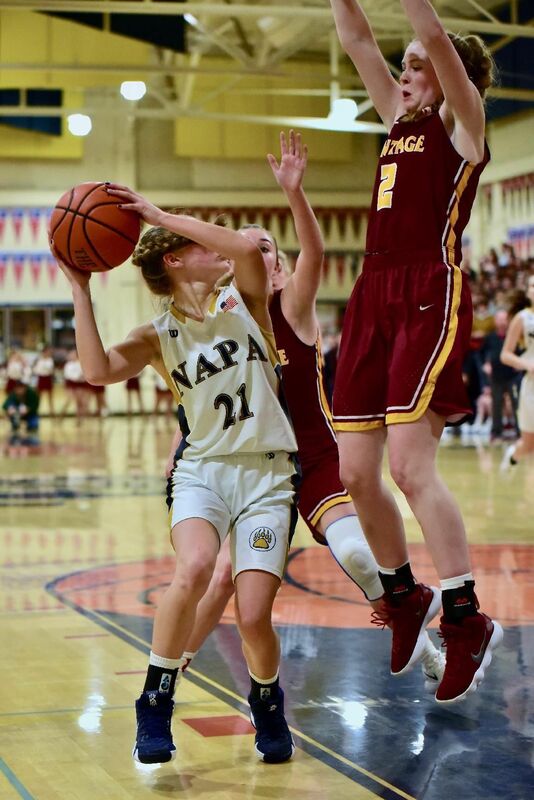 Napa High's Siena Young makes a reverse layup against Vintage on Tuesday night. Vintage's Nicole Gleesen (5) shoots while guarded by Napa High's Siena Young (33) on Tuesday night. Napa High's Carly Johnson dribbles while guarded by Vintage's Maya Sapienza on Tuesday night. Vintage High head coach Joe Donohoe makes a point during a timeout at Napa High on Tuesday night. Napa High head coach Darci Ward talks to her players during a first-half timeout Tuesday night. Napa High's Faith Bartlett (20) makes a shot from the paint against Vintage on Tuesday night. Napa High fans root on their team against Vintage on Tuesday night. Vintage's Kate Ilsley puts up a shot while defended by Napa High's Maizy Armstrong-Brown (32) on Tuesday night. The Vintage High girls basketball team improved to 4-0 in Vine Valley Athletic League play with a 47-28 road victory in this year’s first Big Game against Napa High. Crushers star senior Alyssa Andrews paced her team with 12 points, nine rebounds and seven assists. But Vintage got solid production across the board. Kate Ilsley chipped in nine points and seven boards, Maya Sapienza put up seven points, six rebounds and three assists, and Morgan Groves added six points and a game-high 12 rebounds. Trailing 25-20 with 5:46 remaining in the third quarter, the Crushers (11-5 overall) blitzed the Grizzlies (8-8, 0-3 VVAL) with a game-ending 22-8 run that included four outlet assists from Andrews to Nicole Gleeson (10 points, one rebound). The Crushers have hit that goal thus far in league play, holding four opponents to only 100 points combined. Napa head coach Darci Ward said Vintage’s deadly 1-3-1 full-court zone pressure allows it to be such a force defensively. Siena Young led Napa in scoring with six points to go along with five rebounds. Carly Johnson added five points, five boards and an assist, while Faith Bartlett scored four points and secured seven rebounds. Early on, it appeared the Grizzlies’ raucous home-court advantage would help them keep it close as the teams traded leads eight times through the first three quarters. Napa capitalized on a six-minute Crusher scoring drought to go from down 12-10 at the end of the first quarter to ahead 19-14 with 2:29 left in the half. After taking a 19-18 lead into halftime, the Grizzlies found themselves ahead by five points yet again – before the wheels fell off offensively. Napa managed to get off only 16 shots in the second half, as a barrage of turnovers led to easy Crusher baskets. The Grizzlies will continue to search for their first VVAL win as they prepare for a road match against American Canyon on Thursday night. The Crushers will aim to keep their momentum going when they host Sonoma Valley the same night. With an undefeated league record in tow, Donohoe knows the rest of the VVAL is putting a target on back of last year’s Monticello Empire League champion.